"Reaching and Influencing Africa's Travel and Tourism Markets in the USA,Canada, Europe and Worldwide"
Interviews / ATA in Egypt / Googled us Lately? / Library / Sample Venues 2009 Edition. Week in and week out arrive e-mails and in growing numbers messages via my social media accounts, paying compliments about the wide range of news from the region and then often ending �but where do I find out more about . . . �. The �about� of course then reads Kampala, Nairobi, Mombasa, Zanzibar, Dar es Salaam, Arusha, Kigali or Bujumbura, places readers intend to visit and want to learn more about it before landing. a range of specialized services like schools, doctors and more, it is all found in �The Eye�. Published bi-monthly is it distributed through a wide range of outlets and when the print versions run out are current and past editions accessible on the web by clicking on www.theeye.co.ug . In addition has the �Pearl Guide� emerged and taken hold, where, partly print but largely web based, are regular updates on events and �happenings� accessible for visitors and locals at www.thepearlguide.co.ug . They also launched Uganda�s first �travel app� which can be downloaded for free through a link on their website. The Eye also dominated the scene in neighbouring Rwanda and Burundi, where the A5 sized four colour magazine is published every three months, with similar content. The web address for �The Eye Rwanda and Burundi� is found viawww.theeye.co.rw . In Tanzania is such value added information available today through the monthly �What�s Happening in Dar� which also contains an Arusha section, leaving out however such other cities and towns like Mwanza. From restaurant reviews to new lodges, resorts and camps does the 120+ pages magazine give a broad overview of things a visitor ought to know or be aware of before coming to Dar, be it on business or on pleasure. To see content on the web click on www.whatshappeningtz.com . For the island of Zanzibar can the �Swahili Coast� be recommended, which, published bi-monthly by Javed Jafferi, offers an events guide, an �inside� guide, a map of the �Stone Town� and listings of hotels, resorts and restaurants. The magazine�s information is available on the web via www.swahilicoast.com . www.kenyabuzz.com . They were one of the first in Kenya to launch an �app� which can be downloaded from their web page and will prove to be an invaluable help for visitors to Nairobi and beyond. �Go Places� is the arguably longest �serving� printed guide, now also available of course on the web, and covers all aspects of importance to visitors in a handy format. Most hotel receptions or concierge desks have copies to spare for guests, leaving no one to wonder where to go or what to do when in Nairobi for the weekend. Check them out via www.goplaceskenya.com . available on the web to help make a trip to any or all countries in our region an even better experience. When Jack London (left) wrote "Call of the Wild," he captured the lure that grips us each year when spring is in the air. In other words, there is absolutely no way, we would miss an ATA Congress in Africa. This year's event is scheduled for Banjul, The Gambia, May 17-20, however to give our readers an idea of the outstanding activities, networking and educational opportunities at a typical ATA Congress, we will FLASHBACK to CAIRO, EGYPT in 2009, where history, the pharaohs and good friends from past occasions beckoned us to make the annual journey. 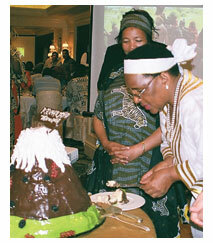 It was the 14th ATA Annual Congress we had attended since Africa Travel Magazine was launched in 1995. As in most of the ATA Congresses and Symposia in Africa, our editorial team of Jerry W. Bird, Karen Hoffman and Muguette Goufrani, played an active part. After the ATA 34th Congress and an outstanding Nile Cruise aboard the Moevenpick Royal Lily from Aswan to Luxor, we returned to Cairo overnight by Egyptian Rail and to Casablanca via Royal Air Maroc. Thanks to Amr Kallini, General Manager of Moevenpick Hotel Cairo - Media City and his staff of professionals for making our stay in Egypt so memorable. Listen to a series of audio interviews with Mr. Kallini and others from Cairo on this website. Since 1995 we have worked diligently to expand our magazine's reach and influence beyond its original target, North America. Now Webtrends gives us a daily picture of who is reading our articles worldwide, where they live- and what topics they prefer.The results on the left sidebar are surprising. Among other duties, Karen Hoffman (right), Africa Travel Magazine's Associate Editor from New York, served as chairman of a panel discussion on marketing. For 12 months in advance of the event in Egypt, we spread the word; online, on air, in print and in person across the USA and Canada. More recently, we circulated magazines and press releases at ITB Berlin, world's largest travel trade show, and Salon de Tourisme in Paris, a popular event with Francophone Africa exhibitors and tourism ministers. We spent the final month in North Africa, visiting contacts old and new in four Moroccan cities, two of which have hosted ATA events in recent years. To gather firsthand information, take photos and conduct in-depth interviews for the magazine's Northern Africa World Edition, Air Highways Edition and Venues World Edition, the editorial team remained in Egypt for a 10 day post congress tour. There are seven other titles in the Africa Travel Library, some available for preview on the magazine's website. Held in Cairo, Egypt for the first time since 1991, the Africa Travel Association 34th Annual Congress attracted over 300 travel industry professionals from the US, Canada and Africa. The delegates included tourism ministers, tourist boards, airlines, hoteliers, ground operators, plus representatives from business, nonprofit and development sectors. 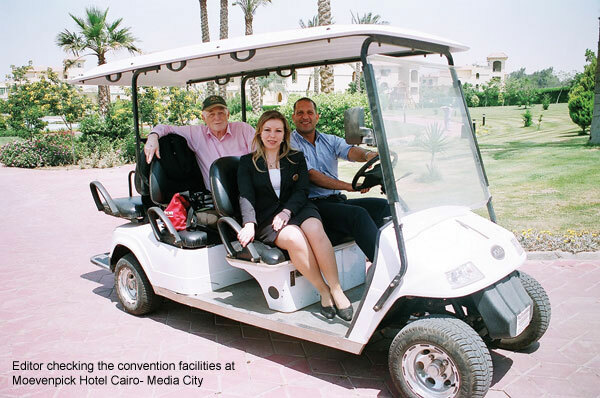 Held at the Conrad Cairo Hotel, May 17-21, the Congress was hosted by the Hon. Zoheir Garranah, Egyptian Minister of Tourism and Amr El Ezaby, Chairman, Egyptian Tourist Authority (ETA). Above: Karen Hoffman, Associate Editor of Africa Travel Magazine since 1995; Left- Hon. Zoheir Garranah, Egyptian Minister of Tourism. We were pleased to greet many longtime members, including one of ATA's founders, tour operator Peter Muiruri (right) of Nairobi, Kenya, who we hosted at an ATA Canada Chapter event in Vancouver, BC, along with over 20 safari operators. Recently promoted by the Ministry of Tourism in Cameroon is Ebenezer Elimbi, whose feature on his country's year round festivals appears in our Central Africa World Edition. Among numerous highlights of the week, was the opportunity to share a table during the gala cruise, with two interesting and enlightened ladies, New York University Professor Sarah Graham Mann, who we first met in Djibouti, and Lisa Simon of the National Tour Association. Sarah will be producing a feature in our magazine on Training Schools in Africa for the travel and tourism industry. Lisa has invited Africa Travel Magazine to cover its annual convention in Reno this fall. Both ladies played a big role in the congress program (more later). 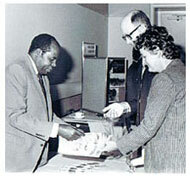 Above: Peter Muiruri of ATA Kenya, taken at the first ATA Congress in 1976. Left: Sara Graham Mann and Lisa Simon at Giza pyramids. Hon. Tadelech Dalecho, Ethiopia State Minister for Culture and Tourism. 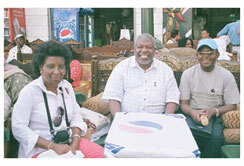 Amant Macha, Director of Marketing, Tanzania Tourist Board (with friends) at Khan el Khalili market. during host country day. Program topics included: Destination Egypt: Something for everyone; Rebirth of Destination Egypt: Leading in troubled times; Bringing the World to Africa: Opportunities with FIFA World Cup; Hotel Marketing Trends: New uses and approaches; Advocacy and Entrepreneurship; Dynamic Media and Internet- New tools for the Travel Industry; Destination Africa; Trends and crosscutting issues; Focus on Africa's travel products; Present and future of air access to and within Africa (see our Air Highways World Edition); Selling Africa in the World Marketplace ( see our Venues World Edition). Africa Travel Magazine's World Editions will expand on many of those topics during the year. It was a real pleasure to meet with Ambassador Daudi Mwakawago of Tanzania again, after his outstanding performane during last year's ATA Congress in Arusha, the world's safari capital. A gold mine of information, with vast experience and a stalwart on the ATA Board, he has served in many key positions. Some of these include his country's Minister for Information and Broadcasting, Information and Culture, Labor and Manpower Development, Industry and Trade - and Tanzania's Ambassador to Sierra Leone. Our editorial team looks forward to printing his topical comments in one or more of our Africa Travel Magazine's World Editions. The Ambassador moderated a panel that discussed Africa's diverse travel products, which ranged from cultural and heritage tourism to youth travel and from fashion to sea and sun. We spent some quality time with Hon. Tadelech Dalecho, State Minister for Culture and Tourism, Ethiopia, who led our delegation to the Houston, Texas International Festival, an exciting two weekend opportunity, where we introduced Africa Travel Magazine's Ethiopia World Edition. She has some good news regarding Lucy's Legacy in New York City, on the heels of similar showings in Houston and Seattle. Other familiar faces were Patricia Brown of Sierra Leone and Amant Macha (below center) of Tanzania, both of whom were with us at ITB. We were sorry that Michael Booker, G.M. of Port Ghalib could not attend, however we plan to visit his Red Sea resort area soon. We met with Ali Liaquat of the Africa Peace Caravan, whose story we were proud to tell in Africa Travel Magazine Let's all hope Ali's problem will be resolved and the program continues this year. Another of the event's leading ladies, Hon. Shamsa Mwangunga (MP), ATA President, led off the program. As Minister for Natural Resources and Tourism, Tanzania, she has presided over one of Africa tourism's greatest achievements, capturing a healthy share of the U.S. market. She introduced Chairman Amr El-Ezaby of the Egypt Tourist Authority, who said, "Until 20 to 30 years ago, Egypt was a one product destination, the Classic Egypt tour. But in the 1980's, Egypt started to diversify its product in order to retain its competitive edge, by developing resort tourism on the Red Sea, desert tourism and cultural tourism. This diversification led to dramatic demand and generated an increase of infrastructure from 18,000 rooms in 1982 to 210,000 rooms in 2008. Today, Egypt is striving to change its image even further by developing high-end resorts to appeal to the luxury market." The success of Egypt's diversification strategy is reflected in the country's continued growth of tourism arrivals despite the challenges of the recent economic climate, realizing a 17 percent growth worldwide in 2008. ATA Executive Director Edward Bergman read the following letter from Dr. Elham M. A. Ibrahim, Commissioner of Infrastructure and Energy of the African Union. "In Africa, tourism is considered as a sector with a very high potential that could contribute more substantially to economic growth, poverty alleviation and overall achievement of the Millennium Development Goals. Africa is endowed with various natural phenomena of high touristic value. Furthermore, the continent has a rich cultural heritage. Yet, Africa accounts for hardly 4% of international tourist arrivals and receipts even though the continent has over 12% of the world's population. The situation is mainly a result of poor infrastructure, inadequate investment, lack of promotion as well as prevalence of a negative image and perceptions especially associated with insecurity and safety aspects in some parts of the continent. Therefore, the African Union counts on ATA to come up with practical solutions, particularly on how to cost-effectively promote Africa's tourist attractions as well as foster cooperation among all tourism stakeholders, including policy-makers, development planners, investors, financiers, operators and the public at large, with a view to addressing the specific development needs of the tourism sector in Africa." With an eye on the FIFA 2010 World Cup, South Africa's Deputy Director-General, Department of Environmental Affairs and Tourism, Sindiswa Nhlumayo, shared his country's perspective on Africa's top event of the year and the resulting benefits to tourism in all of Africa. The official Match Schedule was recently released. The games will be played in Cape Town, Durban, Johannesburg, Mangaung/ Bloemfontein, Nelson Mandela Bay/ Port Elizabeth, Nelspruit, Polokwane, Rustenburg and Tshwane/Pretoria. The matches will take place between June 11 and July 11, 2010. Also on the sports tourism agenda was a presentation by Ango la on the upcoming Africa Cup. Whirling dervish dancers topped off a superb dinner at Cairo's Salah el-Din Citadel, hosted by Egypt's Minister of Tourism. Located on a scenic plateau overlooking historic section of Old Cairo, the Citadel was constructed by Salah El Din on the Moqattam hills to defend Cairo from the Crusaders armies in 1183 AD. The complex house museums, ancient mosques and other points of interest. Our hosts treated delegates to a memorable evening, with a spectacular venue, Egyptian music in the background and one entire side of the main building bathed in floodlights. The positive effect of new hotels across Africa, plus improved training and standards led to a very lively session on the topics chaired by Ethiopia's Head of Standardization & Facilitation, Ministry of Culture and Tourism, Matewos Gebremariam. Panelists included Amr Kallini, General Manager , Moevenpick Hotel, Media City (right), Omar Carrera, Executive Assistant Manager, Sheraton Addis, Starwood Hotels & Resorts, Addis Ababa, Ethiopia, and Glenn Carroll, Senior Vice President, Sales and Marketing, CHI Hotels and Resorts, Malta. Photo: Doorman at Hotel Conrad, ATA Congress headquarters. Karen Hoffman led a discussion on how ATA members can use social networking tools, such as Facebook, YouTube, Twitter, and Blogging to attract new audiences. Sarah Graham Mann, an Adjunct Professor at New York University spoke about the American market and suggested the ways African tour operators can attract the US marketplace. Dr. Yaw Nyarko, Director of the Africa House at New York University, asked the panelists to speak about the need to create a collaborative working document that states why the tourism industry is important for Africa with the support of statistical analysis. Besa Muwele, Principal Statistician at Central Statistical Office of the African Development Bank spoke about the Bank's efforts in this direction. Gaynelle Henderson-Bailey, ATA Board Member and President of Henderson Travel Service, spoke about the upcoming African Diaspora Heritage Trail Conference in Dar es Salaam Tanzania in October, 2009. Gaynelle's husband Lance was also in attendance. Also on the heritage scene, Broadcaster Ogo Sow spoke about the important role the Africa Diaspora can play in the tourism industry. Shahinaz Reza Ahmed, CEO, Education for Employment Foundation in Egypt spoke about efforts to promote employment opportunities in Egypt through collaboration, and Munzali Dantata, Director General of the National Institute for Hospitality and Tourism, Nigeria spoke about educational travel opportunities. A friend of ours from New York, whose group has a big challenge in Africa, Jani Nayar, Executive Coordinator, Society for Accessible Travel & Hospitality (SATH), spoke about accommodating special needs travelers and tourism across Africa. We met a colleague at ITB Berlin whose entire agency is devoted to special needs travel. Our editor attended a group meeting of SATH and ATA in Orlando, Florida and support their cause wholeheartedly. On a topic dear to our hearts, Africa-based airline executives spoke about their current and future plans. The panel included Ashraf Osman, General Manager, Sales, EgyptAir, Gregg Truman, Vice President of Marketing, South African Airways, Cornelia Wilson-Hunter, Manager of the Safe Skies for Africa, US Dept. of Transportation. 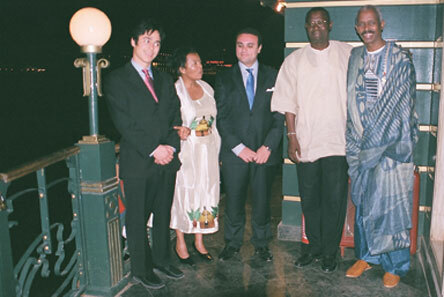 The Tanzanian President's Dinner and 9th Annual Awards ceremony, a perennial favorite at every recent ATA Congress, was at the Cairo's Four Seasons Hotel. Hon.Shamsa Mwangunga, Minister of Natural Resources and Tourism, presented awards to individuals and organizations who have helped promote Destination Tanzania during the last 12 months. 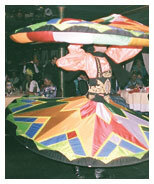 The Minister also led the guests in an evening of Tanzanian food, dancing and entertainment. The Annual Host Country Day featured a tour of Cairo, which included the Egyptian National Museum, the Giza Pyramids and Khan El-Khalili market. It concluded with a dinner cruise on the Nile Maxim Floating restaurant. Photos:Hon. Shamsa Mwangunga cuts the "Kilimanjaro cake," while hon. Tadelech Dalech of Ethiopia looks on ATA Executive Director Edward Bergman (left), Hon. Tadelech Dalecho of Ethiopia and group on deck of the Nile Maxim Floating Restaurant. Photo by Muguette Goufrani. Editor's Blog: Continued (Part 2). NEW AFRICA TRAVEL LIBRARY! MARKETING AFRICA TOURISM WORLDWIDE - IN SEVERAL LANGUAGES! For 14 years we have partnered with African Tourism Ministries and ATA to produce many full color travel magazines. Issues included Namibia, Benin, Tanzania, Ghana, Morocco, South Africa, Ethiopia, Cameroon, Guinea, Nigeria, Zambia, Angola, Djibouti, Kenya, Uganda and Egypt- plus features on many other countries. Now in addition to single destinations issues we introduce World Editions on 5 UN sub regions - Northern, Southern, Eastern, Western and Central Africa. To attract visitors to trade shows involving Africa Travel. Trade and Tourism,we introduce our Venues World Edition, updated electronically daily or weekly and launched in print prior to the top travel trade shows, such as WTM, ITB, New York Times, Indaba - and many more. CLICK TO SAMPLE THESE TWO PAGE SPREADS!